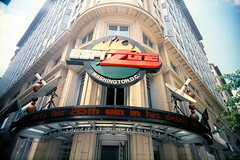 Via Thrillist this morning, the now-closed ESPN Zone is auctioning off pretty much all of their arcade games and the going prices aren’t bad. Knowing the WeLoveDC audience, I figured there would be some of you out there interested in getting your gaming hands on some of these classics. Aside from the games, the auction includes lighting, furniture and industrial kitchen equipment from the Zone, so if you’re in need of an ice cream machine or a heavy duty deep fryer this is your auction. If I lived in a group house, I would totally be ALL over my housemates to chip in and buy one of these beauties. Personally, I’m partial to the Trophy Hunting (Bear & Moose) and the Super Shot games, but I’m sure the Slapshot Hockey and Washington Redskins Football Throwing game will be big fan favorites as well.